Copyright � 2009, American Society for Microbiology. 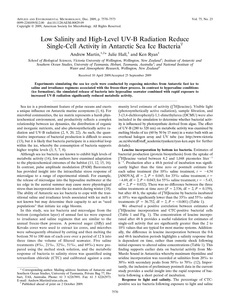 Experiments simulating the sea ice cycle were conducted by exposing microbes from Antarctic fast ice to saline and irradiance regimens associated with the freeze-thaw process. In contrast to hypersaline conditions (ice formation), the simulated release of bacteria into hyposaline seawater combined with rapid exposure to increased UV-B radiation significantly reduced metabolic activity.